You know those wispy white lines that are left behind by aeroplanes in the sky? They're contrails, right? Wrong, dude! They're only contrails to the all-accepting, propaganda-gulping, sheep-minded masses, man. Every person out there with an IQ in double-figures knows that they're actually chemtrails! That's right, bro: chemtrails. The powers that be are spraying us will all kinds of up to no good. And while so-called 'scientists' might try and explain away contrails as simply the product of water vapour in a jet's exhaust condensing in the nut-nippingly frosty conditions up there to form what are basically clouds, you and I know that this is actually the perfect covert dispersal unit for the governments' population reducing, illness inducing, weather warfare falutin' chemical agents. Oh, you think this is nuts? You think this is just some whack conspiracy theory dreamt up by a bunch of right-wing loons who are convinced the world is controlled by reptilian alien overlords who will soon seize power for the New World Order? Then look up in the sky, man. See the chemtrails for yourself! I saw a plane the other day and that evening I sneezed, bro. Twice. Coincidence? You decide. Do please leave your most trailingly reptilian comments in the box below. Yes, definitely coincidence. Contrails are water vapour condensation trails; no more no less. Run a highly modified hydrogen fuelled jet engine and what do you get out of the exhaust? Pure water vapour; which when it freezes under your nut nipping conditions will give you a contrail. Like modern car engines, jet engines today are made very clean and fuel efficient. 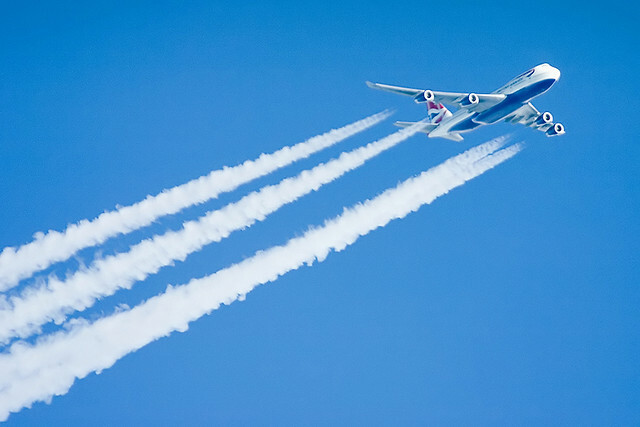 At full throttle at take off there will be some hydrocarbon particulates in the exhaust but when cruising at high altitude, they will be very low. This must be one of the dumbest conspiracy theories ever. Only the word suits; CONspiracy Theory off the RAIL's. Your local single figure IQ, NWO agent. You're at one with The Man, man. Open your eyes to the skies.